Easily grown in average, medium moisture, well-drained soil in full sun to part shade. Thrives in part shade, but tolerates full sun as long as soils are kept moist. May grow somewhat taller in part shade than in full sun. Tolerant of a wide range of soils, including sandy or clay, but prefers rich moist loams. Prune immediately after flowering to shape and to maintain compactness. Remove root suckers promptly if naturalization is not desired. If planted in the St. Louis area (northern part of USDA Zone 6), it should be given a root mulch, sheltered location and protection from cold winter winds. Flowers are reportedly sterile, so plant will not produce viable seed. Calycanthus raulstonii, commonly known as Raulston’s allspice or sweetshrub, is a large, upright-rounded, thicket-forming, multi-stemmed, suckering, deciduous shrub which typically grows to 8-10’ tall and as wide. 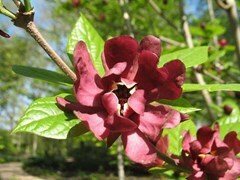 This species is the result of a cross between Calycanthus chinensis and Calycanthus floridus. It features mildly fragrant maroon flowers in spring (sometimes continuing through summer to early fall) on plants clad with opposite, leathery, irregularly toothed, glossy, ovate to elliptic, emerald green leaves (to 7” long) which turn buttery yellow in fall. Leaves are rough above and pubescent below. Commonly called sweetshrub but the within plant has much less flower fragrance however. Specific epithet honors the late J. C. Raulston of the North Carolina State University Arboretum who helped develop this plant until his death in 1996. Plants in the genus Calycanthus are commonly called sweetshrub or strawberry bush in reference to the fragrant blooms which are often described as combining hints of pineapple, strawberry and banana. ‘Hartlage Wine’ is the original clone of this intrageneric cross. It was named after student Richard Hartlage who crossed Sinocalycanthus chinensis (Chinese species) with Calycanthus floridus (U.S. species) in 1991 at the JC Raulston Arboretum at North Carolina State University. It is noted for its stunning maroon fading to wine-red flowers which bloom primarily in April-May. Opposite broad elliptic leaves. Woodland gardens. Specimens around homes and in foundations. Shrub borders. Native plant areas. Dappled shade. Hedge.